Surah No 25 "Al-Furqan / The Distinction"
He to Whom belongs the dominion of the heavens and the earth: no son has He begotten nor has He a partner in His dominion: it is He Who created all things and ordered them in due proportions. Yet have they taken besides Him gods that can create nothing but are themselves created; that have no control of hurt or good to themselves; nor can they control Death nor Life nor Resurrection. But the Misbelievers say: "Naught is this but a lie which he has forged and others have helped him at it." In truth it is they who have put forward an iniquity and a falsehood. And they say: "Tales of the ancients which he has caused to be written: and they are dictated before him morning and evening." Say: "The (Qur'an) was sent down by Him Who knows the Mystery (that is) in the heavens and the earth: verily He is Oft-Forgiving Most Merciful." And they say: "What sort of an apostle is this who eats food and walks through the streets? Why has not an angel been sent down to him to give admonition with him? "Or (why) has not a treasure been bestowed on him or why has he (not) a garden for enjoyment?" The wicked say: "Ye follow none other than a man bewitched." See what kinds of companions they make for thee! But they have gone astray and never a way will they be able to find! Blessed is He Who if that were His will could give thee better (things) than those Gardens beneath which rivers flow; and He could give thee Palaces (secure to dwell in). When it sees them from a place far off they will hear its fury and its raging sigh. And when they are cast bound together into a constricted place therein they will plead for destruction there and then! Say: "Is that best or the eternal Garden promised to the righteous? For them that is a reward as well as a goal (of attainment). The Day He will gather them together as well as those whom they worship besides Allah He will ask: "Was it ye who led these my servants astray or did they stray from the Path themselves?" They will say: "Glory to Thee! not meet was it for us that we should take for protectors others besides Thee: but Thou didst bestow on them and their fathers good things (in life) until they forgot the Message: for they were a people (worthless and) lost. (Allah will say): "Now have they proved you liars in what ye say: so ye cannot avert (your penalty) nor (get) help." And whoever among you does wrong him shall We cause to taste of a grievous Penalty. Such as fear not the meeting with Us (for Judgment) say: "Why are not the angels sent down to us or (why) do we not see our Lord?" Indeed they have an arrogant conceit of themselves and mighty is the insolence of their impiety! The Day they see the angels no joy will there be to the sinners that Day: the (angels) will say: "There is a barrier forbidden (to you) altogether!" And We shall turn to whatever deeds they did (in this life) and We shall make such deeds as floating dust scattered about. The Companions of the Garden will be well that Day in their abode and have the fairest of places for repose. That Day the dominion as of right and truth shall be (wholly) for (Allah) Most Merciful: it will be a day of dire difficulty for the Misbelievers. The Day that the wrongdoer will bite at his hands He will say "Oh! would that I had taken a (straight) path with the Apostle! "He did lead me astray from the Message (of Allah) after it had come to me! Ah! the Evil One is but a traitor to man! Then the Apostle will say: "O my Lord! truly my people took this Qur'an for just foolish nonsense." 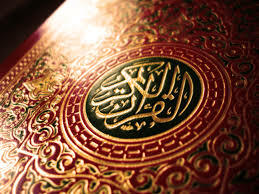 Those who reject Faith say: "Why is not the Qur'an revealed to him all at once?" Thus (is it revealed) that We may strengthen thy heart thereby and We have rehearsed it to thee in slow well-arranged stages gradually. Those who will be gathered to Hell (prone) on their faces they will be in an evil plight and as to Path most astray. And We commanded: "Go ye both to the people who have rejected Our Signs": and those (people) We destroyed with utter destruction. As also `Ad and Thamud and the Companions of the Rass and many a generation between them. To teach one We set forth parables and examples; and each one We broke to utter annihilation (for their sins). When they see thee they treat thee no otherwise than in mockery: "Is this the one whom Allah has sent as an apostle?" "He indeed would well-nigh have misled us from our gods had it not been that we were constant to them!" Soon will they know when they see the Penalty who it is that is most misled in Path! Or thinkest thou that most of them listen or understand? They are only like cattle; nay they are worse astray in Path. Then We draw it in towards Ourselves a contraction by easy stages. And He it is Who makes the Night as a Robe for you; and Sleep as Repose and makes the Day (as it were) a Resurrection. That with it We may give life to a dead land and slake the thirst of things We have created cattle and men in great numbers. And We have distributed the (water) amongst them in order that they may celebrate (Our) praises but most men are averse (to aught) but (rank) ingratitude. Therefore listen not to the Unbelievers but strive against them with the utmost strenuousness with the (Qur'an). It is He Who has let free the two bodies of flowing water: one palatable and sweet and the other salt and bitter; yet has He made a barrier between them a partition that is forbidden to be passed. Yet do they worship besides Allah things that can neither profit them nor harm them: and the Misbeliever is a helper (of Evil) against his own Lord! He Who created the heavens and the earth and all that is between in six days and is firmly established on the Throne (of authority): Allah Most Gracious: ask thou then about Him of any acquainted (with such things). When it is said to them "Adore ye (Allah) Most Gracious!" they say "And what is (Allah) Most Gracious? Shall we adore that which thou commandest us?" and it increases their flight (from the Truth). Say (to the rejecters): "My Lord is not uneasy because of you if ye call not on Him but ye have indeed rejected (Him) and soon will come the inevitable (punishment)!"